An exuberant crowd of Gov. 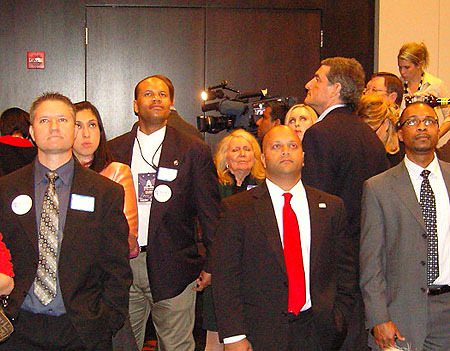 Mitt Romney supporters who gathered at the Chicago Republican Party at theWit Hotel became dispirited as incumbent president Barack Obama was reelected for a second term Tuesday night. Others were equally hopeful, their eyes glued to the many TV projection screens around the ballroom that broadcasted up-to-the-minute voting results from networks like ABC and Fox News. “I’m here just because of what the sign says, because I believe in America,” said supporter Suanna Lynn, referring to the red, white and blue signs emblazoned with the Romney/Ryan ticket that lined the cream-colored walls. Lynn said she thinks corporations should have a lower tax rate and thinks this will build incentives for job creation domestically. Higher taxes will push businesses overseas, she said. Yet, as more polling returns were reported, the atmosphere became tenser. As both candidates were tied in electoral votes, each holding 153 just after 9 p.m., Romney’s supporters stood in angst. Later, only a smattering of applause and cheers broke out when projections showed Romney winning states like North Carolina at about 10 p.m. Obama’s electoral vote count jumped to 244 following a win in California, and his projected victories in swing states like Florida and Ohio, as reported by a number of outlets, drew audible groans. Romney supporter Marty Abezetian expressed his disappointment in Obama’s leadership, saying he has watched his taxes skyrocket and feels the country cannot afford another term under Obama’s leadership. 32nd Ward Committeeman John Curry remained optimistic for a late surge in Ohio votes for Romney, citing a remaining “26 percent plus of the vote and a 50,000 vote margin out of millions cast” to be accounted for. “Anything can happen the rest of the night, so I’m not throwing in the towel yet,” said Curry. At 10:20 p.m., a number of outlets finally projected President Obama to win re-election with 275 electoral votes — five more than the requisite 270, as opposed to Romney’s 201 votes. Romney supporters in the ballroom had mixed expressions of shock and dismay upon hearing the results, which were shortly followed by State Treasurer and Chairman of the Romney Illinois Campaign, Dan Rutherford, taking the stage to address those in attendance.